7/5/12 - Acquisition - Montpellier, Musée Fabre - At TEFAF 2011, the Canesso Gallery had exhibited a canvas by Lionello Spada representing a Lamentation of Christ Dead (ill. 1) which we had illustrated in an article devoted to this trade fair on the French site, saying it was one of the most beautiful paintings on view there. We had known for several months that the Musée Fabre in Montpellier was trying to raise the funds for its acquisition, with help from patrons. A few days before a press conference presenting the exhibition on Caravaggism to take place this summer in Toulouse and Montpellier, for which this work was to be one of the main attractions, the Musée Fabre finally succeeded in meeting its goal . A native of Bologna, originally a student of Cesare Baglione, Lionello Spada was influenced successively, first by the Carraccis, attending their Academy as of 1603, then by Caravaggio whom he never personally met but whose works were familiar, having been in Malta then in Rome around 1608-1614. That same year he returned to Emilia where he participated in the décor for the sanctuary of the Ghiara, in Reggio Emilia (notably the cupola). He died in Parma, at the Farnese court. 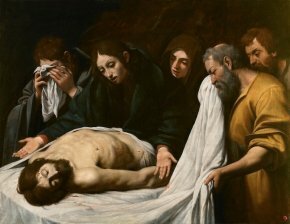 The Lamentation of Christ Dead dates back to around 1614, according to historians, produced after his stay in Rome and his return to Emilia. The work is obviously very marked by Caravaggio in the realism of the figures, its composition and the manner in which it stands out against a dark background but also, as Véronique Damian points out in the entry of the Canesso catalogue, by Ludovico Carracci as seen in a canvas with the same subject acquired by the Metropolitan Museum in 2000. This addition to French museum collections is also a masterpiece of prestigious provenance. It was in fact part of the Chigi collection and resided in their Roman palace before being in the one at Ariccia. Sold in 1958 to a private Roman collection, it was authorized to leave Italy only recently. Once again, the French art market has played a major role in enabling French museums to enrich their holdings. The more paintings found at art dealers working in France, the better the chances that these will eventually become part of the French national heritage. Out of a total cost of 800,000€, the city of Montpellier donated 240,000€ ; the state 35,799€ ; the Fonds Régional d’Acquisition des Musées Languedoc-Roussillon 41,668€ ; the Fonds du patrimoine du Ministère de la Culture 150,000€. The rest, that is a little over 330,000€, comes from private donors, none of whom have yet been named.